There may be light at the end of the tunnel for the cocoa industry of St Vincent and the Grenadines. âThe first one is a Vincentian citizen, but from the United Kingdom. He has been living in Bequia for quite some time; a fairly wealthy individual. I donât think he would want me to call his name,â Gonsalves said. The Prime Minister explained that he has met with the individual and that person is currently holding discussions with Minister of Agriculture, Saboto Caesar. Additionally, Gonsalves indicated that Hotel Chocolat, a British chocolatier and cocoa grower, which owns a small entity in St Lucia, has also expressed their interest in the local industry. During a press conference on Monday, Gonsalves informed journalists that the British companyâs interest was conveyed to him via a representative from the British High Commission and that discussions will begin soon. âWe are working out now when is it they can come again to meet. Let us see what happens so that the cocoa industry can still proceed,â the Prime Minister declared. the Grenadines after operating here for about three years. Minister of Agriculture Saboto Caesar had said at the time that the SVCC had projected to cultivate between 5,000 and 7,000 acres of cocoa, but over the last four years, they were only able to rehabilitate 50 acres of cocoa lands, and plant 200 new acres, and had enough plantlets to cultivate another 200 acres. Caesar said that this was not enough to satisfy the expectations of the SVCC. and a wealth of research information, for the Government to continue. On August 5, 2014, a group of cocoa farmers calling itself the St Vincent and the Grenadines Cocoa Producers Cooperative Society Ltd., elected its first executive. 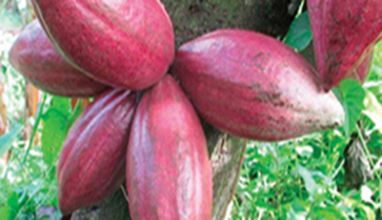 The group has expressed the objective of developing a full cocoa industry, beyond the mere planting of cocoa.